Complimentary Beach Service included March 1 – October 31! This Silver Shells St. Lucia three-bedroom vacation home is an “end unit” design that wraps floor-to-ceiling glass around the Living and Dining areas creating fantastic views and easy access to the wrap-around Gulf-front Balcony which is also accessible from the Master Bedroom. 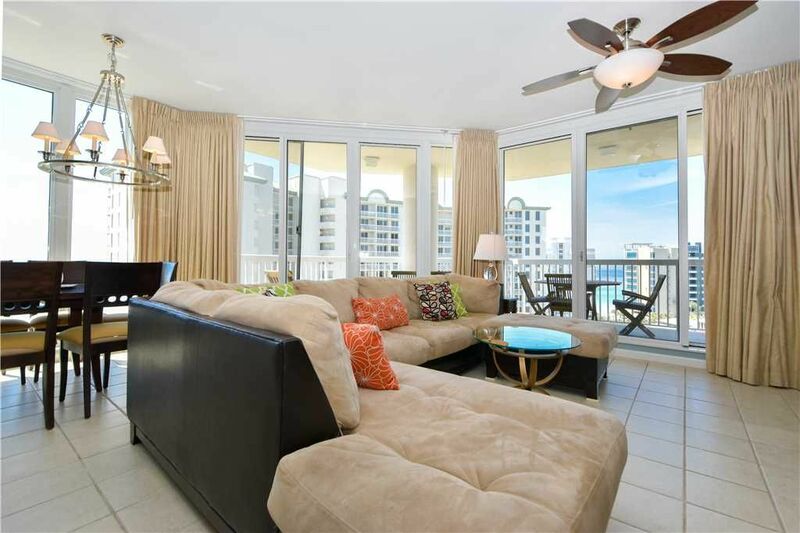 In addition to the main Balcony, St. Lucia 1001 also has a North-facing Balcony which is accessed privately via both Guest Bedrooms, and overlooks the greater Destin area. The St. Lucia building, set on the eastern side of the resort, has its own pool in addition to the large Lagoon Pool and the indoor/outdoor Pool. Ask about Lagoon-side Cabanas! The Cabanas are available for a minimal additional fee and are right alongside the giant Lagoon Pool. They are a great escape from the heat and have air conditioning, a mini-fridge, half-bath, and cable television. This open-concept Living Area is very spacious and tiled throughout. The Living Area has large, plush furnishings and a flat-screen TV. Adjacent are the Dining Area and Breakfast Bar with seating for your entire group, and the Kitchen has granite counter tops and is fully equipped with dishware and cookware. The Laundry Room is off of the Kitchen and has a full-sized washer and dryer set in addition to a utility sink. The roomy Master Bedroom boasts a King Bed, flat-screen TV, a walk-in closet, and a Master Bathroom with two vanities, a jetted tub, and a tiled walk-in shower with bench seat. Both Guest Bedrooms offer a Queen Bed, flat-screen TV, large closet, and a private Bathroom. The 1st Guest Bathroom has a vanity and tub-shower combination, and the 2nd Guest Bathroom has a tiled walk-in shower. There are two Twin Roll-away Beds for larger groups. Beachfront vacationing at its best is what Silver Shells Beach Resort and Spa has to offer! Located in Destin, Florida, this gulf-front, gated condominium features beautiful beaches, gulf-side lagoon pool, children’s pool, playground, hot tub, tennis courts, fitness center, European-style spa, Ruth’s Chris Steakhouse, tiki beach bar and grill, indoor/outdoor pool, BBQ grills, assigned covered parking, and close proximity to attractions, shopping, and dining – this property has it all! Guests provide their own beach towels. The condo was spacious and beautiful, the grounds were fun and well-maintained, and the beach was close and pristine. We were close to stores and restaurants, and we THOROUGHLY enjoyed our stay here at Silver Shells! Well kept condo. Negative: balcony seating was MOST uncomfortable!! Really nice condo we had a really good time! It was a perfect place to enjoy our family vacation. The condo was very clean and checkin/checkout was easy. Loved it! Very clean, relaxing, easy beach access. Can't wait to go back! We definitely plan to go again. We had a great relaxing vacation.